This week's Spotlight is on author Jacqui Jacoby and her latest release Dead Men Play The Game! 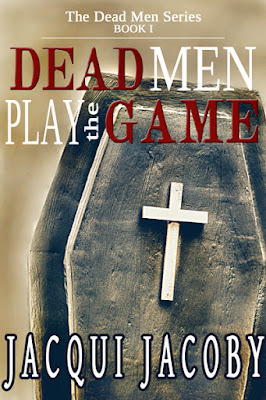 There will be giveaway of Amazon GC and a Kindle copy of Dead Men Play The Game to one commenter! 1. How did you pick the title for your books? Seven months of continuous searching for the right sound that described the idea behind the stories. Hours of searching Amazon on titles of books with friendship, paranormal and vampires. Meticulous note taking on my phone of possible ways to go. Until a Tuesday, in the kitchen, in month eight, when it was sotra like a hammer to the forehead. "Well, duh ... that's the title." Seven months of searching, a moment of revelation. 2. How did you choose the setting for your books? Depends on the book. WITH A VENGEANCE was set all over the world as the spies took flight. The Dead Men, they are restricted by their nature and physical limitations to live in a specific environment: they can't be in direct sun. That limits the United States to The Pacific Northwest. Story dictates location, I think. 3. How did you come up with the names for your heroes and heroines? Characters name themselves. If you try to mess that, they will refuse to work with you and sit on the sidelines until you get it right. Trust me on this. I tried changing a Scott to Mitch once and man he was mad. Background, physical appearance, hobbies, it all plays a part, but in the end, if they don't they like it, they will let you know. 4.What makes your heroes irresistible? That's like asking what ice you want. There are so many different varieties. In WITH A VENGEANCE, the hero, Stephen Reid was dedicated to the people around him and the ones he loved. He would give his life for any of them or buy them a beer, depending on the occasion. The heroes in The Dead Men, are very similar. Each with a distinct personality with ages ranging from seventeen to thirty-four, every single one of them would die to protect the other, without question and without regret. In romance, all of them, in both books (Ven/Dead Men), they bring this to their love life, giving personally first before taking anything for themselves. In 1984 I lived in London for four months. As a history major in college, with a lean toward strange, I decided to locate and visit the graves of all of Henry VIII's wives. It took me three of the four months. I found all six but only got to visit five as the last was in the chapel of a private estate. I also did The Jack the Ripper pub walk at midnight in Whitechapel, but that's another story. 6. Your advice to new writers. Finish it. Yes, that story you are working on. No matter what other story is itching to displace it, keep typing on that first story and keep a notebook on the next. Finish one, then you can start the next. After decades of murderous violence to survive day to day by taking human souls, five cold blooded killers will come to the decision that their lives have been wrong since the day they were turned. Their brutal, predatory actions were unforgivable in their minds and each knows they want more than the killing and blood and death that make up each of their nights. "We were hard-wired different at our turning," vampire Jason Sullivan explains. "Somehow part of humanity stayed with us and after a long, cold period of insanity, we were able to find it again …." 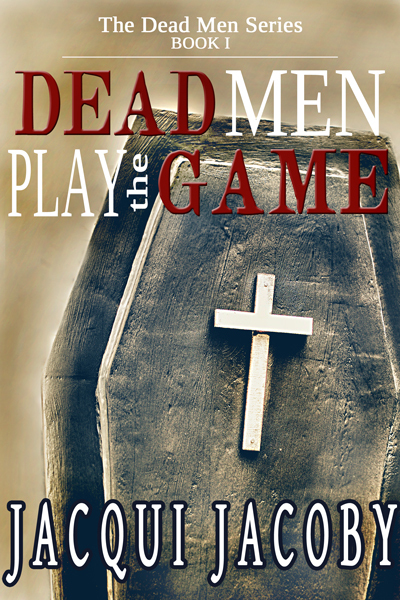 In Book I, DEAD MEN PLAY THE GAME Ian Stuart has fought against the monster controlling his life, living as a human among humans with his four friends: Travis, Jason, Quinn and Evan. He wanted his personal loneliness to go away. Detective Ashley Barrow is working the worst murder case in Davenport, Oregon's history. She wants a drink, she wants some quiet and she walks in to sit on the stool in Ian Stuart’s pub. My characters name themselves too, and I'm thankful for that. I am so glad to hear you enjoyed it. It was really a lot of fun to write as these were the most alive characters I ever met. Would be nice if they could shut up sometimes, but hey, part of the job!! The time zone thing always gets me. I'm in Arizona and I think you're not So while I;'m expecting to start tomorrow, tomorrow is already there for you. And inspiration, I don't know. I saw this show and the wandered the whole week thinking "Really ... but what if ..." Day seven I ha the outline,. Same with Vengeance, only that was six hours from what if to whole plot. 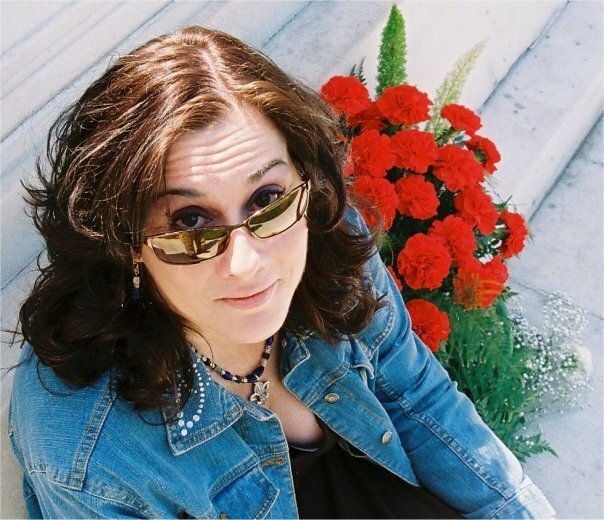 Hello, Jacqui! Best of luck with your new release. Thank you very much. Luck is always nice. I seem to be doing okay, though. Opening numbers on Dead Men were real pleasing. Sounds like a couple more good books, too. I haven't read much in the way of vampire books, but this one sounds very different from others I've read. I'm intrigued. Good luck with it, Jacqui! My guys -Ian, Travis, Jason, Quinn and Evan-- are very much not your standard vampires. They each chose a reason to follow a different path, joining the little band of merrimen at different times until they were a family. They work very hard not to be the monsters they were. Hope you enjoy it. Thank you William. I appreciate you saying that. Congrats, Jacqui! And you have me intrigued by the Jack the Ripper pub walk. That's so true about characters' names too. They won't accept just any ol' name. Congratulations on the release! I loved Dead Men Play The Game and I'm looking forward to other books in the series. Thanks Kelly. Really glad you enjoyed it. I loved reading all about you, thanks for sharing and congrats on the release! Congratulations on the release, I'm off to buy this book on Amazon! Now that is the kind news I want to hear. I want everyone to meet my guys. Enjoy. It took me awhile to come up with the title of one of my recent drafts, months to be exact. I love London. I've spent quite a bit of time there. Titles can be brutal. You'll be standing in the produce section thinking "Oh, that's it" and a second later, it's "What was I thinking?" I did eight months of that. My husband named my book i like two seconds and it was perfect AND annoying: Magic Man. Scary stuff here, Jacqui. Your premise is quite unique. Interesting that you visited almost all of Henry the 8th's wives' graves in England and did the--gulp--Jack the Ripper pub walk. Love the cover of the book. I wish you all the luck with your novel. Thanks for sharing this interview with your readers, Nas. I've been a grave hunter for decades. It's actually a very little known hobby. You find one who intrigues you, research them, learn their life and then at some point visit their resting place and bring flowers to pay your respects. Hollywood is my fav. Had a nice conversation with Marilyn last September. Congratulations to Olivia Rose! You won this contest! Please contact Jacqui Jacoby! Totally agree with you about titles and characters. A title is giving me fits right now, but I know it will come. When it's ready.